Brambell Natural History Museum, Bangor University will be joining museums from across the country for this year’s Welsh Museums Festival, which will be taking place from 27 October – 4 November. This wonderful annual event is an opportunity for everyone who lives in Wales, or visiting over the half term, to engage with and explore the fantastic museums we have across Wales. As ever, this year’s event will have a varied programme of events to cater for all tastes, which include exhibitions, re-enactments and workshops, through to Halloween themed activities. 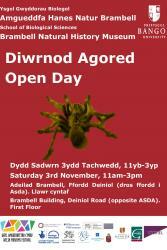 Bangor University’s Brambell Natural History Museum, will be open to the public on Saturday, 3rd November 11am-3pm as part of the festival. This will be an opportunity to visit the University’s Natural History Museum, which is not usually accessible to the public, to learn more about the specimens on display. There will be a chance to ask questions of the available volunteers, and there will be an activities corner for children of all ages. It is intended to improve access to Bangor University’s hidden museum collections and this is part of Storiel’s work in partnership with Bangor University. This event will offer local residents and visitors a chance to enjoy and learn about the vast variety of specimens on display. For a full list of all events taking place as part of the Welsh Museums Festival visit www.museums.wales.